My younger brother is a pretty cool guy. Funny, too. But obviously not as awesome or hilarious as I am – it’s the “Law of Older Brothers” or something like that. Being brothers, we understand each other pretty well due to the unique relationship that we share. We agree on subjects, but we also bicker and quarrel whenever we see fit. Yet, at the end of the day, despite the arguments that we might have, I know that we are always looking out for one another. Because he’s not just my family but my baby bro. Samurai Warriors sets its sights on a tale of two brothers that ultimately fails at nearly everything that it tries. The setting is feudal Japan, where captains, soldiers, and legendary fighters have amassed to take part in the unification of the country. 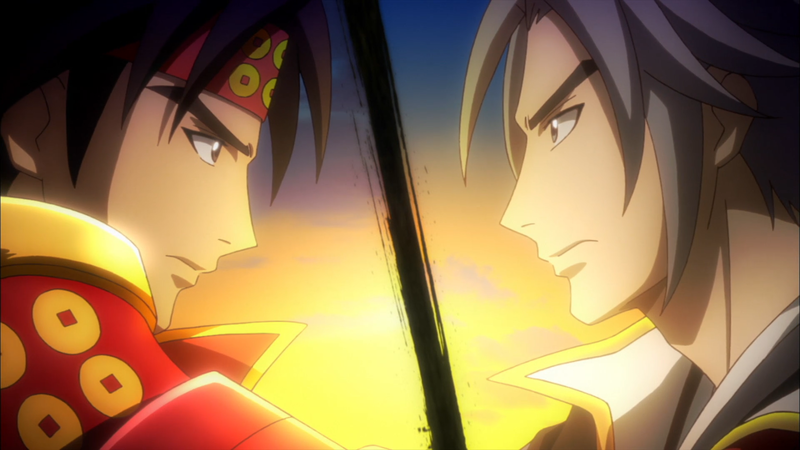 Yukimura Sanada and Nobuyuki Sanada, two brothers serving under Lord Hideyoshi, take part in the war. 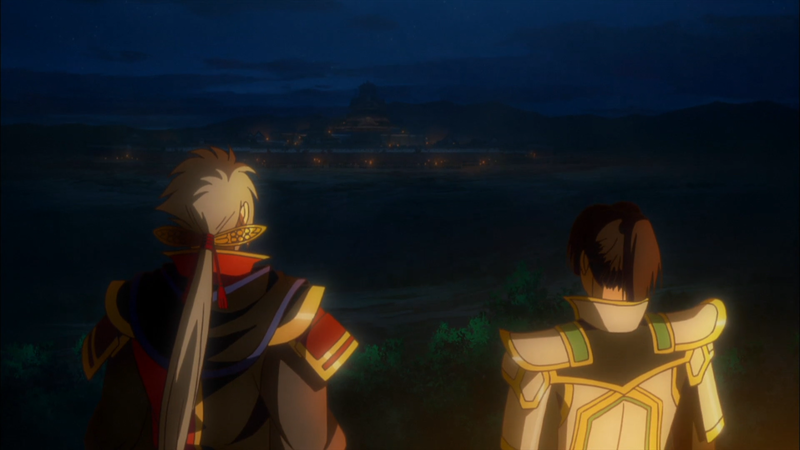 However, Hideyoshi passes away, creating a rift not just in his followers but in the Sanada duo, too. A little outside context is necessary. 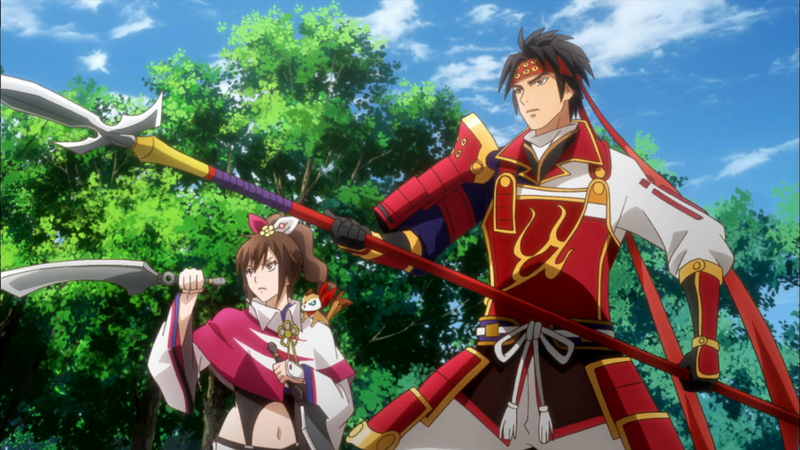 Samurai Warriors is an anime adaptation of a video game series of the same name. It, like its Dynasty Warriors cousin, is similar to a hack-and-slash romp where you, the main player, select a character to annihilate every foe that surrounds you. The difference between yourself and the common soldier is almost unfair. And this is where the anime encounters its first problem. The show spends a lot of time on using clunky narration to describe the battles, the formations, and the reasoning behind certain actions. But none of it matters because, like the games, everything hinges on the major warriors. The soldiers are fodder to the warriors’ mighty weapons, rendering them useless in nearly all circumstances. And the only parts of the war that have a clear influence in any capacity are the duels that occur between the warriors themselves. That last point, considering how much these people count in comparison to everyone around them, should happen quite a bit. But strangely, the show nearly refuses to have these men and women duke it out between each other, despite being a pivotal aspect of the show. 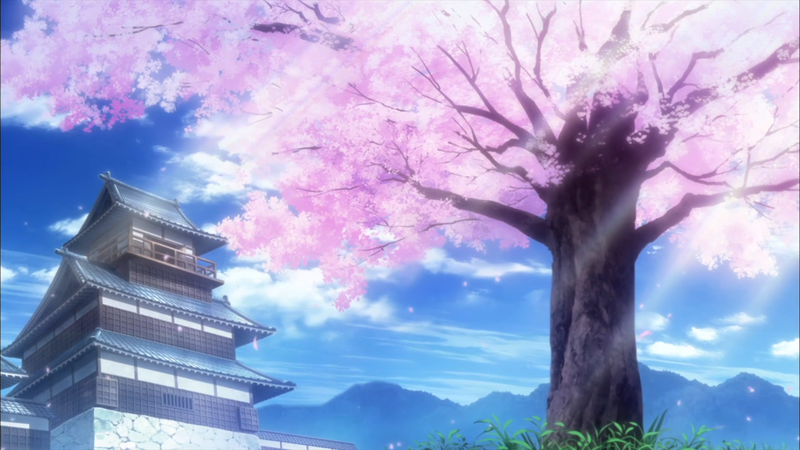 Instead, the anime leans on its unimportant surroundings – namely, the soldiers and formations. Even when the anime has these behemoths clash, the duel goes on for so short a time that nothing of value is obtained from either side. Arguably the most important of the fights, theme and narrative-wise, is the Sanada brother’s final brawl, yet it lasts (generously) two minutes. To put it another way, the show does not utilize its literal and figurative strongest facets to its advantage. Say you ignore the anime’s own ignoring. What’s left is a mess of situations that tend to go in strangely awkward directions. The show wants these scenarios to mean something, but again, the majority of the emphasis is placed on these supposed warriors and the fights that “ensue.” So they are ultimately poorly handled, involving strange outcomes or, once again, lost meaning. For instance, Masanori and his buddy Kiyomasa defect to the Tokugawa clan, but then become enlightened to the error of their ways, and defect back to their original Toyotomi clan without consequence. Another is Hideyori’s mindset. While he wants what is best for his people and the country, not only does he engage in war but then proceeds to continue said conflict after having gone through not just a truce but a debasement of Osaka, the city he was governing and protecting. There are even specific characters that see this same, jumbled approach. Nene was Hideyoshi’s wife, but following his death, she becomes a wandering ninja that maintains minimal relevancy by showing up once in a while to say a few philosophical words. And Kotarou is an evil dude whose intentions are never made clear, but he aides Hidetada Tokugawa, the son of Ieyasu Tokugawa and the leader of the Tokugawa clan, to get some kind of revenge against Yukimura. Kotarou supposedly dies (it’s rather unclear) but worst still, he’s forgotten about and later on Hidetada becomes a pseudo-good guy for the nation despite using this assassin for his underhanded tactics and personal abrasiveness caused by naïveté. The separate events come off as not making much sense, with their combination concocting the sluggish narrative presented. There isn’t too much to say about the art of Samurai Warriors. It’s pretty boring, with only a handful of nice backgrounds to look at. These mostly are scenic in depiction, with ancient castles and pleasant landscapes. Otherwise, the anime employs heavy use of “action” environments to plaster the characters onto, taking away from the “regular” portions of the war once more. The anime also chooses to use CG animated troops when the platoon sizes get too large, but the repetitive use of the same scene comes off as lazy at best. One of the shows only saving graces are the character designs it contains. Each cast member is often provided a unique look or outfit to easily distinguish them from the rest of the warriors and especially the normal soldiers. Ina’s long ponytail, blue cloak, and plentiful accessories keep her beautiful despite taking part on the battlefield. Keiji’s lion-esque hair, white-and-purple cord, and regal red garb make him as large and opposing as he comes off as being. And Masamune’s eye-patch with his green, classic Japanese samurai attire with accompanying samurai sword demonstrates just how cool he is. However, the actual animation for the anime is far below average. Forgetting that the main fights between the warriors are short, the amount of movement within them is inexcusable given the anime and its premise. The show often incorporates jump-cuts to signify something happening without actually showing it, all the while reiterating the same sword or pike swings ad nauseam. Even smaller nuances like facial expressions or flames of fire are low in animation, making the entire experience come off as a few frames instead of a few thousand. Samurai Warriors has a pretty massive cast. Unfortunately (thankfully?) there is no need to remember nearly any of them due to how minimal of focus they receive. This isn’t even the anime’s entire fault; the structure of the show has about half of it focused on fighting rather than character exploration, so the other half needs to be divided as nicely as possible for the twenty plus characters. Some are entirely one-dimensional in their characterization, while others obtain zero-dimensional status with nothing other than their name to back up their person. A few manage to scrape by, but they cannot pull their own weight. Take Hideyori for example. As the son of Hideyoshi, the former lord to unify the kingdom, he champions his father’s cause. He doesn’t just take after his father in looks, but also in demeanor and behavior. In short, he is a true leader. And he appears pretty intelligent for his age, yet everything he does or says seems counterproductive to his overall goals. He refuses to comply with others, he fights losing battles, and believes that his martyrdom will bring about a new era. It does, but none of what he did directly had this affect. He could have just as easily not done these things – abide by the rules set for him, agree to cooperate, and not kill himself – and everything would have ended up exactly the same. Nobuyuki, Yukimura’s brother, is equally strange. He chooses to fight for the Tokugawa clan, believing that by conquering the land through more violence will eventually bring an end to said violence. It’s an interesting idea, with him never wavering in the path he’s chosen. He even guides his younger sibling to make choices befitting his (Yukimura’s) ideals. Rather touching, except that he literally has no qualms with killing him. The explanation behind it is shady – that Yukimura’s “kind” cannot “exist” in the time following the end of the “Warring States Era” – but worse than this is they’re brothers. Brothers don’t do this to each other. No matter how much honor has to be upheld, what rules are set, or who stands in their way, you’re bound by blood. The show acknowledges this; Nobuyuki mourns for his brother when the war concludes. But not only was he trying to kill him in the first place but it also goes against the very ideals he holds and enlightened to Yukimura. Namely, the notion of sticking true to your path. So watching him cry over the brother he rivaled with over the entire series not only comes off as silly but also undermines his very character. There is one character that manages to make his mark. This is none other than Yukimura. One of the show’s themes is this idea of finding your “own way in life,” but something a bit more profound is the anime’s showcasing of conflicting ideologies. This idea can be seen in the problems that manifested between both the clans and the brothers. For Yukimura, he very early on seemed to be going with the flow; following his older brother, his lord, and his friends, he didn’t seem to have a personal set of convictions to follow. 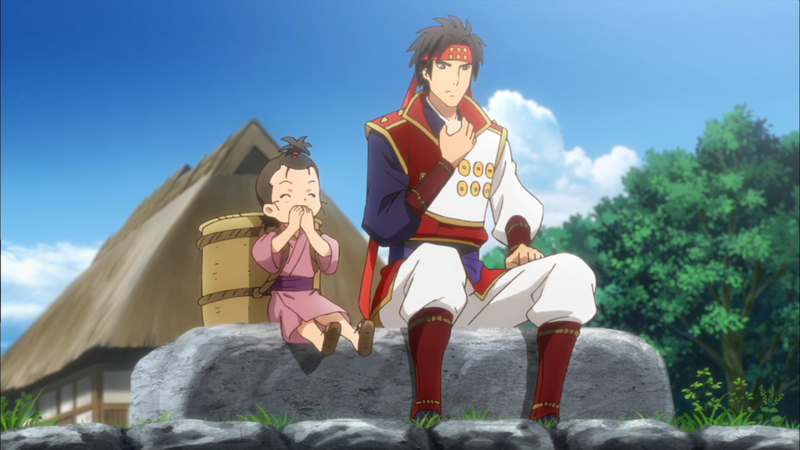 Nobuyuki points this out, forcing Yukimura to ponder the road he should take. And he comes to the answer: he is, at his core, a samurai warrior. After deciding on the course to take, he goes through with it, believing in both his previous alliances and his newfound will. He goes all-out to the point of death, showcasing as great as he could how stalwart his passion had become and the extent to which differing mindsets can (given the context) ultimately lead. The opening actually has a pretty nice beginning and end; it’s fast and filled with adrenaline. But the middle section is more a flurry of sound than a well-composed piece, making the majority of the track hard to listen to. The ending theme definitely has the feudal Japan vibe about it, with the shamisen and slow, female vocalist. It trails off weirdly as it concludes, and sounds more or less the same from start to finish, making it a boring piece overall. Listening to the original soundtrack, while many of the pieces may be culturally based, none of the tracks in particular hold much power despite the warriors doing the opposite. Many of them sound identical, even when they are adjusted for melancholic or fight-oriented situations. It’s a forgettable OST, falling in line with the rest of the anime’s offerings. Voice acting is somewhere slightly below average. Yuuko Nagashima as Kunoichi provides an underwhelming performance, with the rest of the cast doing nothing more than screaming now and again. I had grown up playing Dynasty Warriors with my friends, so when I first started this one, I thought it would have that same feeling of fun. Because that’s what those kinds of games were about. It wasn’t the “story” that they had (there really wasn’t one), it wasn’t the “combat” that took place (you really only pressed the X button over and over), and it wasn’t even the world, the stuff to unlock, or the characters (I only remember Lu Bu and how ridiculously difficult he was to beat). Their staple was hacking and slashing your way to victory, sometimes with a friend by your side. To that end, the show never had that same fun because it doesn’t translate from the game to the anime. Taking away the control, making it so that the part that you want to participate in is only available to be watched, removes any sense of satisfaction because it now becomes a part of those facets that weren’t fulfilling in the first place. Watching the narrative, skills, and characters unfold, like it was with the game, isn’t entertaining, no matter how much they tried to make it seem. At the minimum, watching as Yukimura laid waste to everyone and everything was pretty funny. His devotion to being a warrior and his unfair strength was a little over-the-top, even compared to the others, but that at least made the latter half of the anime not unbearable to witness. 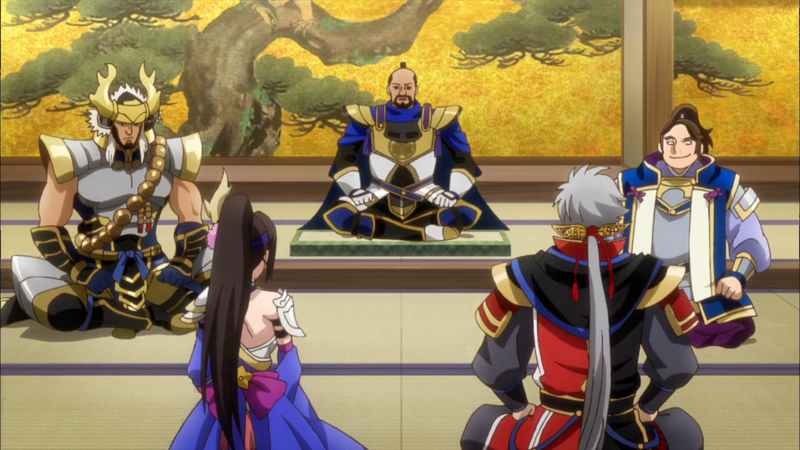 Samurai Warriors is certainly an anime about such people. But its haphazard story, sub-par animation, weak characters, and lame music craft a show that is almost entirely atrocious to behold. The best it can do now is commit “seppuku,” for that’s the only sense of worth it has left.